Camel Snus, the latest smokeless tobacco product to hit the American market, is not your grandfather’s chaw. Available in three flavors and packaged in attractive tins, Snus does not have to be spit out and therefore can be used just about anywhere -- “at a concert, right in front of security guards,” “on a jet from Miami to L.A.,” or at an “overpriced tapas restaurant,” a promotional brochure suggests. And Snus delivers a powerful dose of nicotine: eight milligrams in each pouch, a spokesman for the R.J. Reynolds Tobacco Company, which manufacturers Snus, acknowledged on Wednesday. A pouch amounts to a single dose. 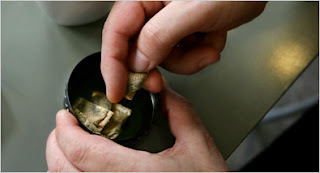 That’s far more nicotine per gram than is present other popular chewing tobacco products, according to some researchers, who are concerned that Snus may turn out to be both carcinogenic and highly addictive. Chewing tobacco regularly increases the risk of developing oral cancers; recent studies have associated heavy use with increased odds of pancreatic cancer, as well. The European Union banned sales of an earlier formulation of Snus in 1992 after a World Health Organization study determined the product could cause cancer. Snus is still sold in Sweden, where it originated, and in Norway. Health officials in West Virginia analyzed a version of Snus marketed earlier this year in parts of the United States and found it contained five milligrams of nicotine per gram of tobacco, or about two milligrams per pouch serving, said Robert Anderson, deputy director of the prevention research center at West Virginia University. Since then, he said, the amount of tobacco and the concentration of nicotine in each pouch appear to have increased. “The nicotine in these products doesn’t happen by accident,” Mr. Anderson said. The latest packaging does contain more tobacco, 0.6 grams per pouch instead of 0.4 grams, and therefore more nicotine, according to R.J. Reynolds spokesman David Howard. The disclosure dismayed some public health officials. “It’s so high in nicotine that the probability of becoming addicted to it with utilization of just one tin is going to be very high,” said Bruce W. Adkins, director of the division of tobacco prevention of the West Virginia Bureau for Public Health in Charleston, W.Va. But by providing users a nicotine fix without lighting up, Snus may tempt consumers to ignore initiatives designed to reduce tobacco use, such as indoor smoking bans, experts said.